Opposite to the lamp I could see something that thus far has appeared for me only in simulations: diffuse arcs extending all the way from the anthelic point to the subanthelic point. The effect is not that impressive in photos. Neither is the anthelion which really caught my attention: an anthelion formed against the ground in just few meters of air space. In the image above I had tilted the camera sideways so that it is not aligned with the central column of the tripod. This makes the shadow in the middle of the arcs less disturbing. In the image below, taken earlier, I had not yet done this move and there is a more prominent shadow. The image above is a bit spoiled because of spotlight light getting in from the viewfinder. 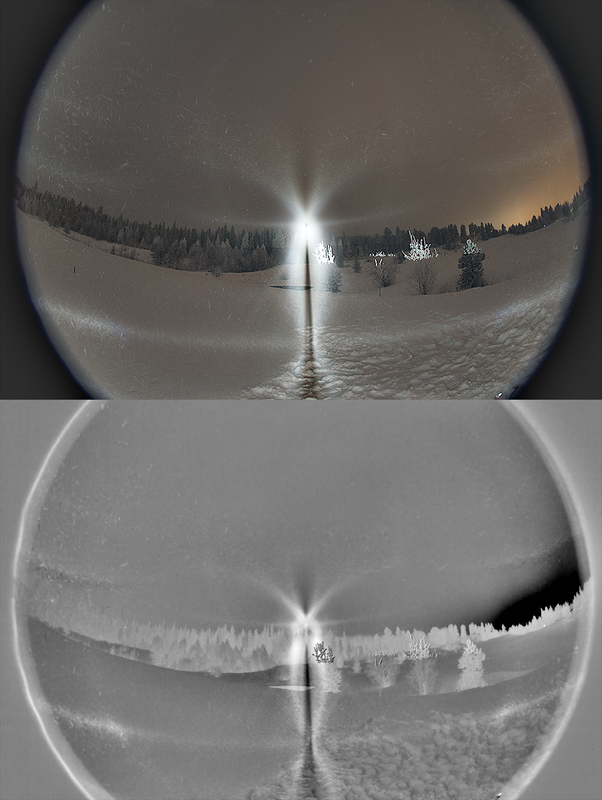 I thought the camera was broken and bought a new one two days later... On one night in the beginning of January Mikkilä called while I was out photographing at around -35° C (-31° F) temps, and he told it was about light leaking. I didn't buy it, having a false memory of the effect appearing also when I shot towards the lamp. In the end it had to dawn that Mikkilä was right and also a feeling (maybe false too) that I must have known this thing in the past but my brain had buried it too deep by now. So, where was I... yes, of some interest in these photos is the blue edge of the diffuse arc (the 3157 type). 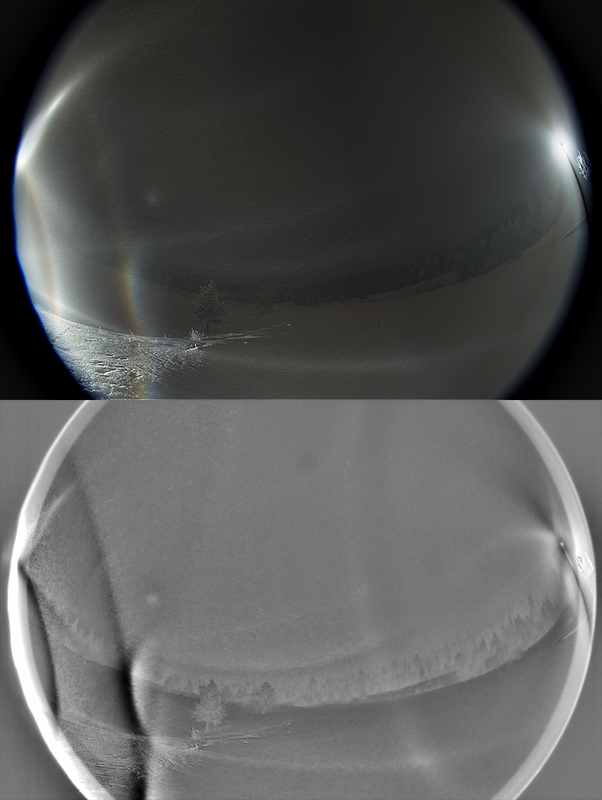 Below are two more shots showing the anomalous Hastgener. These stages of the display are not really that poor (see part II), was I too hasty to make that connection? (Somehow I succeeded in not seeing these photos when writing the part II even if they were ready made in the same folder). 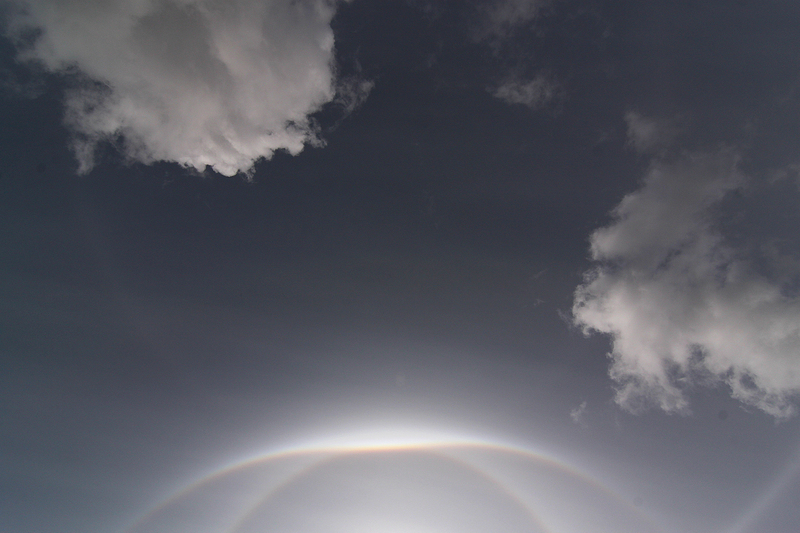 Notice the left side subparhelion which seems tilted in the first image which is a single frame. 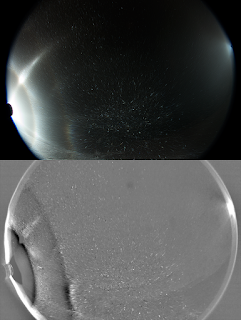 The breeze makes localized, passing disturbances in crystals' orientation and can cause effects like this. At least that's what I seem to think now, but who knows if it is true. Anyway, I think there is a frame from stacking series from one other display where the other subparhelion is completely missing. Here is a collection of images showing an arc that looks like a downwards curving Hastings or Wegener. 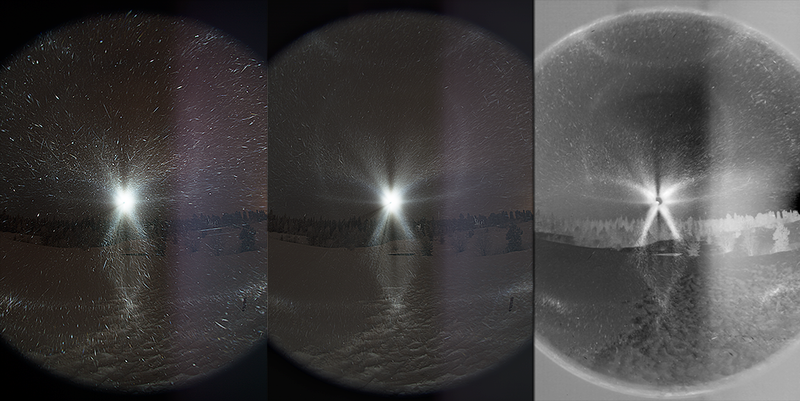 It's nothing new: the arc was first observed in Rovaniemi on 23 November 2015 and again nine days later in the evening of 2 December. I don't know how it is made, but it seems to occur when the display is suboptimal as compared to its best development. 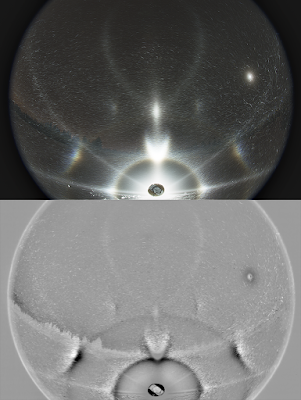 A halo that thrives on (relatively) crappy crystals? In the display on the evening of 14 December 2016 this anomalous Hastgener was captured on several stacks, one of which is shown above and which also has normal Hastgener. Below are two more photos of which at least the left side one shows the effect. It was true to form, as these stages did not represent the peak of the display. 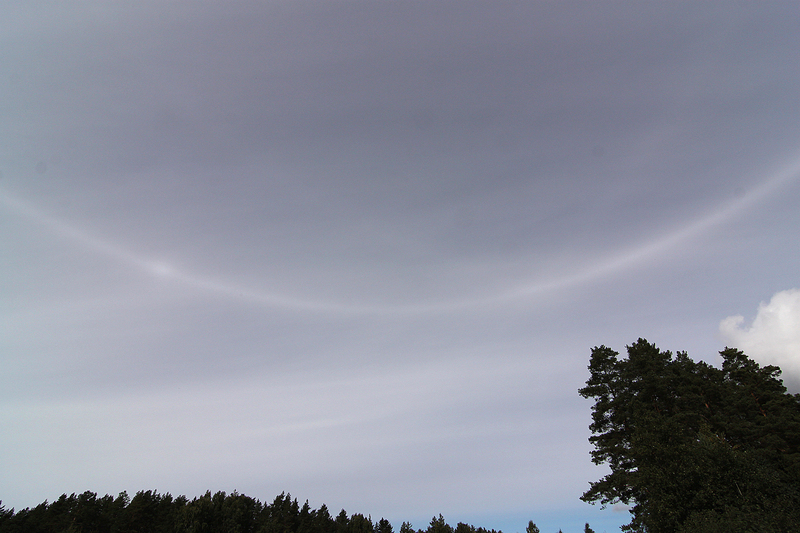 There was an additional oddity: the Hastgener / anomalous Hastgener has a kind of parhelia near the tangent arc. 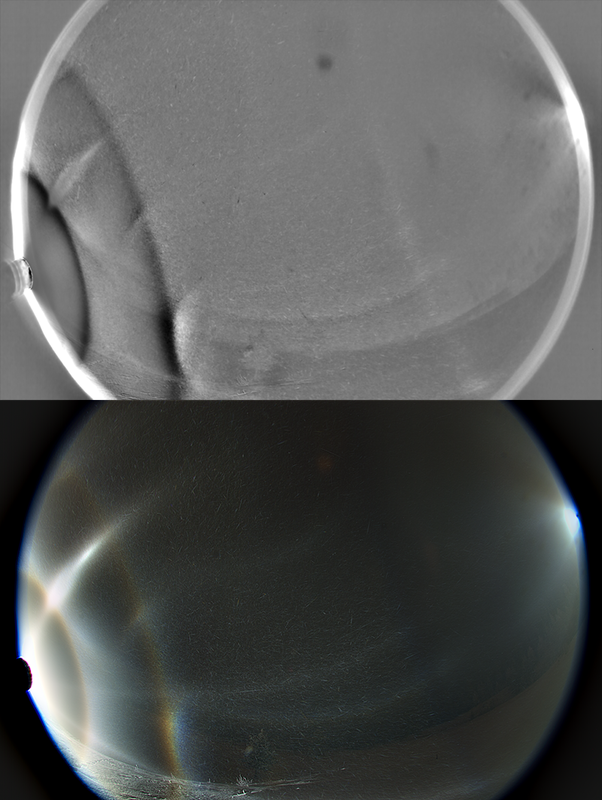 The feature occurred intermittently and was well visible to the eye. 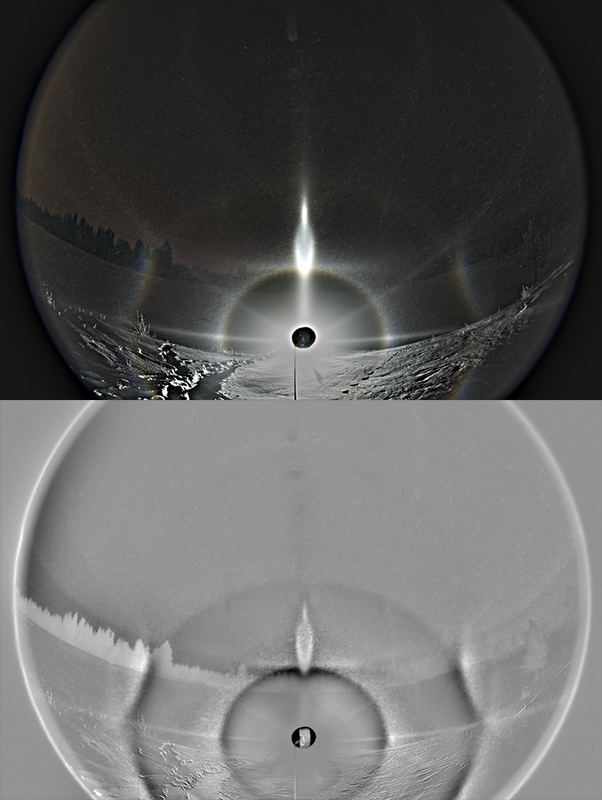 Below are two images showing this "parhelia", the one on the left is a single frame. The brightening seems to be also present in the main image above. Kimmo Laitinen captured a nice display with Wegener arcs and a really strong lower tangent arc on the 2nd September 2017. I'll let Kimmo describe his observation in greater detail in his own words. He says, "we drove from Siilinjarvi to our summer house in Leppavirta via Kuopio. In Siilinjarvi the weather was sunny but before Kuopio a thin uniform layer of high clouds covered the sun and we spotted the first halos as we passed the city centre of Kuopio about 11.45.... At this point the 22 deg lower tangent arc was not so impressive and only a short section of the parhelic circle could be seen. Then we went on southward to the Puutossalmi cable ferry.... 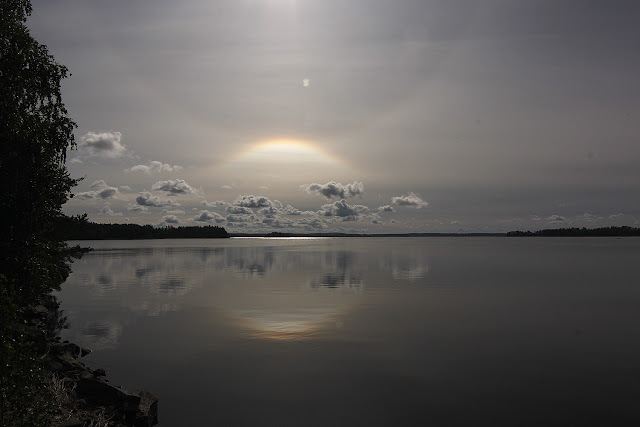 In Puutossalmi the 22 deg lower tangent arc was the most impressive and reflected nicely from the lake. 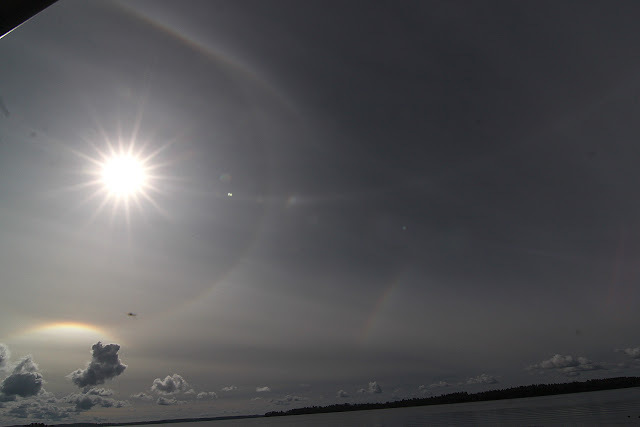 After the ferry the 22 deg lower tangent arc disappeared but the parhelic circle became all the time longer and a very faint Wegener arc was seen by the naked eye. After driving a few km more southward the low clouds disappeared from the northern sky and the parhelic circle became complete about 12.30 in the village of Lansi-Saamainen in Leppävirta. The 120 deg parhelia were clearly visible and the intersection of the Wegener arcs with the parhelic circle was revealed from the images. After this the display got dimmer but still lasted for a few hours. All images used by permission. © Kimmo Laitinen. The comments in a recent post brought very sharply into focus the problem of halo classification and nomenclature; what do we call a particular halo form, why do we call it that, who gets to decide on that name and where does it fit into the overall halo classification. 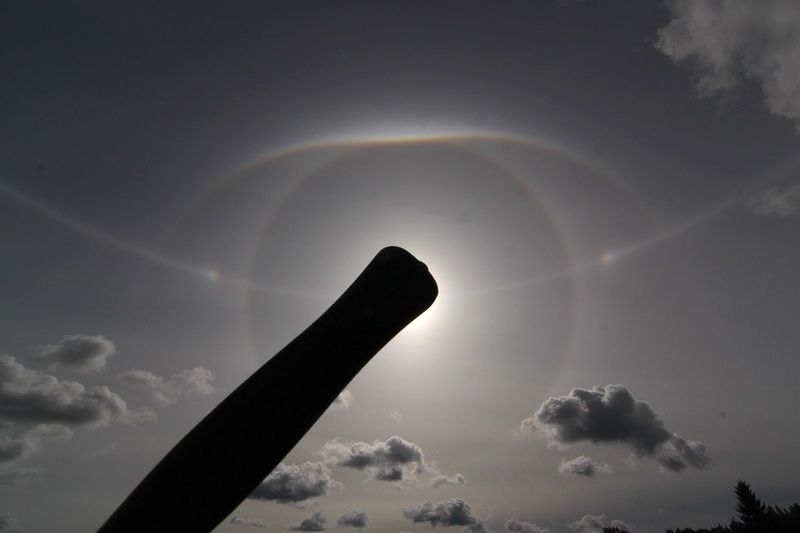 The study of halos is, generally speaking, a relatively new science and discipline. 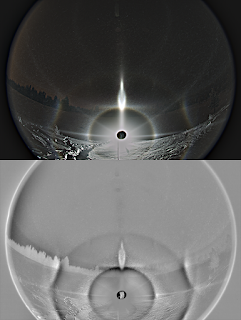 Serious research into halos has accelerated during the latter half of the twentieth century up to the present and by and large it has been overwhelmingly led by committed amateurs with only the occasional dalliance of “professionals”. 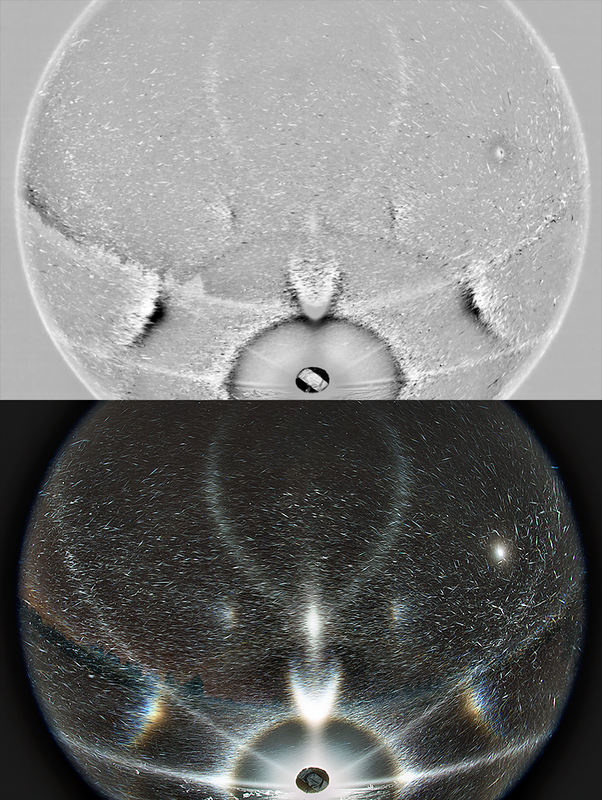 One result of this has been a certain lack of clarity in the classification and naming of halos. We can all probably think of at least one halo that has two or more names or halos that have had a change of name over the years as the understanding of its nature has deepened. In other branches of science there are various organisations and protocols which govern the naming and ordering of things. However, in the halo community we are basically on our own. No-one is going to step in and wave a magic wand and it is up to us as a community to come to some sort of consensus and develop a meaningful and workable taxonomy. In recent years we have sometimes witnessed very heated debates amongst those who are most active in serious halo research. This has led to a situation where because of a certain amount of stubbornness and entrenched views, individuals and the wider community are no longer addressing and engaging with the problem. The aim of this short post is therefore to try to open up the conversation once more and solicit new ideas and suggestions on how we should proceed. The need for this discussion is becoming increasingly urgent. 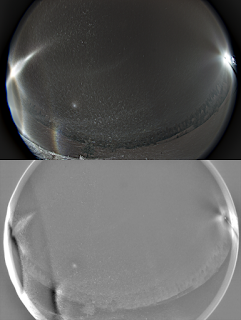 There are so many new halos being discovered all the time that we need some way of describing them and being able to relate them to some overarching system of classification. What I would like you to do is to think about taxonomy in general, and halo classification and nomenclature in particular. It may be that no one system is “correct” and that two or more may adequately describe and account for what we see. I think that whatever system is finally decided upon it should be fairly open and flexible, so that it is able to handle the new and the unexpected. I appreciate that this may seem to be a very dry subject when many people these days are content to see endless photos of increasingly rare and spectacular displays. However, I think it is of the utmost importance to our discipline. We need to get it right now so as to prevent serious problems in the future. Over to you, the comments are open!